Nettipattam is an important ornament worn by elephants during Hindu festivals in Kerala. Legend has it that the Nettipattam was designed by Lord Brahma. And Airavata, the white elephant of Lord Indra, was the first lucky elephant to wear it. The caparison, which is part of Hindu astrological art, represents the entire pantheon of gods in Hinduism. Nettipattam is mentioned in the Sangam Works dating back to 200 BC to 100 BC. Earlier, this headgear was only used during festivals. Today, it is available as wall hangings in different sizes. People believe that the caparison brings prosperity and peace as it represents the Hindu gods in entirety. Nettipattam is today proudly displayed in the living rooms of houses, in shops, business establishments and hotels. Miniature version of it is displayed in cars. Today it is available in shops around the world and even in online stores. Popular Kerala temples which have a store attached to it sells Nettipattam. 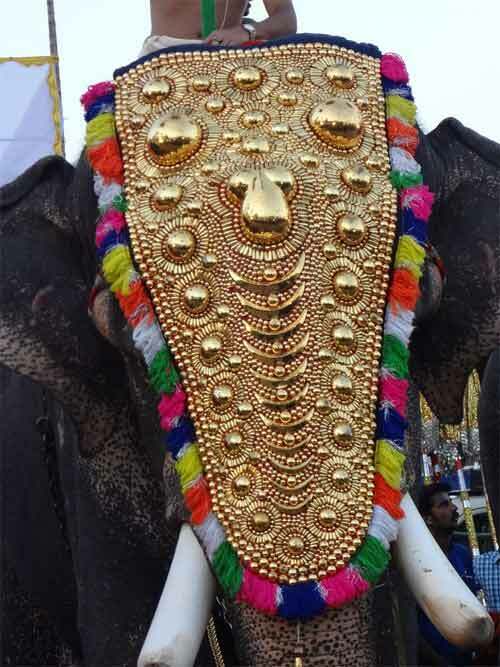 During Kerala Temple festivals each elephant wears an eye-catching Nettipattam, a fringed cloth onto which is sewn an intricate arrangement of different sized gold-plated copper semi-circles, all so close together that it is impossible to see the backing cloth. The nettipattam's design has remained unchanged for centuries and every year many temples, certainly those who can afford it, send their nettipattams to be replated and sewn onto new cloth. Nettipattam is accompanied by the 'Alavattam' and 'Venchamaram' in festivals.